U.S. defense department contractors reach out to Rosoboronexport for munitions. Five major U.S. government contractors – Alliant Techsystems Operations, Chemring Ordnance and Military Products, General Dynamics Ordnance and Tactical System, Bulova Technologies and Arma Global – have approached Russia’s Rosoboronexport to supply Russian-made ammunition on a subcontract basis. The move was prompted by a tender announced by the U.S. Army Contracting Command in April for nonstandard weapons and ammunition intended for international coalition forces, including U.S. and NATO troops and their partners conducting operations in Afghanistan, as well as Afghan military units, and U.S. military units still stationed in Iraq to train Iraqi troops in counterterrorism operations. As the Afghan army, much like the Iraqi army, is equipped with mostly with Soviet or Russian small arms (Kalashnikov AK-47, AK-74 guns and their modifications and light machine guns), Russian munitions are in demand. The army inventory includes 82mm and 120mm mortars and D-30 122mm howitzers, Russian helicopters purchased by the Pentagon for the coalition forces. In addition, the Afghan Army uses Russian unguided missiles and rockets, T-62 tanks and BMP-2 infantry combat vehicles, all of which need munitions. 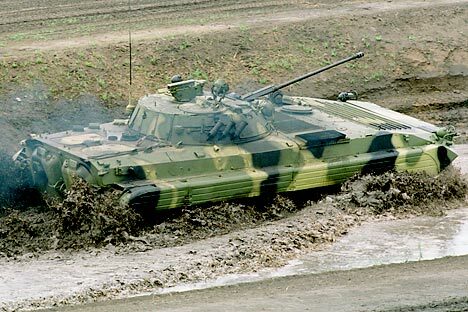 The benefit of the Russian weapons for NATO and U.S. forces is their unfailing reliability in difficult conditions; one of the reasons the U.S. command contacted Rosoboronexport was the tendency of copies of Russian weapons and munitions produced in Bulgaria, China and Egypt to malfunction at the most critical and inopportune moments. The prospects for cooperation with the United States are definitely good for Rosoboronexport. First, it gains another client interested in Russian armaments and, perhaps more importantly, the company finally gains access to the American market. Until recently, Washington refused to recognize Rosoboronexport as a qualified organization and even tried to impose sanctions against it. Finally, the talks indicate that the U.S. government is finally realizing that any fake Russian armaments produced elsewhere without a license and adequate control by developers cannot be regarded as high quality, reliable military products. This might be a signal that, sooner or later, the Americans will switch to buying only licensed weapons from Russia and crack down on counterfeit arms. As soon as it received the invitation to cooperate, Rosoboronexport announced it was ready to supply the bulk of the ammunition in question and hoped for fair competition among the bidders. The five potential bidders were simultaneously presented with a price offer and a warning against the risks of buying counterfeit weapons produced in former Soviet countries under expired licenses, which do not meet the quality requirements of the weapons developers. Russia has also moved to introduce amendments stipulating compliance by the newly purchased ammunition with the requirements set by these developers.